Bakewell Baking Festival is designed as a giant summer garden party. As Britain’s only baking festival, it’s held in the ‘Spiritual Home of Baking’, famous for its Bakewell pudding. It will appeal to lovers of all things vintage and baking. Fans of The Great British Bake-Off will find their baking nirvana here. With Star Bakers making an appearance in the Theatre, Baking Masterclasses and competitions, along with a vintage soireé, music and family fun, The Bakewell Baking Festival is sure to thrill. Best of all, there’s a custard pie fight. In recent years, baking in Britain has undergone a massive revival. The popularity of the hugely successful BBC TV show The Great British Bake Off, with the nation’s baking sweetheart Mary Berry and baker, Paul Hollywood, has largely led the way. Nostalgia and vintage are fashionable again as people hark back to a simpler technology-free way of life. Put the two together and it’s led to the rise of vintage style tearooms festooned with bunting, cupcakes galore and the ultimate icing on the cake, a festival dedicated entirely to baking. Held at the show ground in Bakewell, this 3 day extravaganza has it all. The main attraction is a line up of celebrity bakers which in 2015, included Tom Herbert who appears alongside his brother Henry in the wonderfully delicious programme The Fabulous Baker Brothers. Fresh out of baking college, he won Young Baker of the Year with an ambition to ‘do for bread what Rick Stein has done for fish’. He runs the Hobbs House Bakery in Nailsworth, Gloucestershire. From The Great British Bake Off, you’ll see Star Bakers such as, Edd Kimber, a former winner and now an author of three cookbooks including The Boy Who Bakes, Say It With Cake and Patisserie Made Simple; Howard Middleton, a former contestant, who now teaches at Hartington’s artisan food school in Bakewell and Iain Watters who caused a national uproar by throwing his baked Alaska in the bin. Watch activities such as gingerbread decorating and Indian bread making, drink teapot cocktails at a summer vintage soireé, play vintage games or treat yourself to a special Champagne Afternoon Tea. The cherry on the pie is ‘Pies and Prejudice’, a Mr Darcy Custard Pie Fight devised to pay homage to Jane Austen. 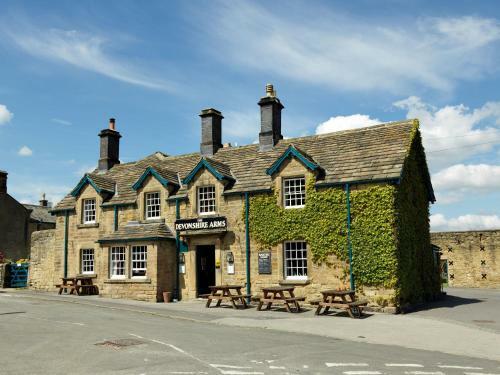 She completed her famous novel Pride and Prejudice at the Rutland Arms Hotel in Bakewell. Well-behaved dogs on a lead are allowed at the festival but not in any marquee or anywhere where food preparation is taking place (except guide dogs). Find more Foodie Things To Do in the Peak District. Discover more Food Festivals & Events.